The Gowanus Canal is a 1.8 mile long canal constructed in the 1860’s located in Brooklyn, New York. The canal is bordered by three former Manufactured Gas Plant (MGP) sites and various historic waterfront industries. The canal was designated a United States Environmental Protection Agency (USEPA) Superfund Site in March 2010. Bench scale testing was performed in 2011-2013 to determine potentially applicable mix designs for the pilot study. Geo-Solutions provided the experience necessary through a similar ISS Sediment pilot project previously performed. In 2015, the 7th street turning basin, which is attached to the Gowanus canal, was decided to be the location of the program. Solidify MGP NAPL-containing sediments under marine conditions and generate sufficient performance data to evaluate the application of the technology under typical conditions. Provide accurate details within the QC/QA reporting. Maximum productivity throughout the test demonstration. Create one continuous monolith of all 9 mix designs. Minimize environmental disruption to surface sediments and canal water quality. Complete 9 mix designs within the allotted 18 day test program. For this unique ISS demonstration project, Geo-Solutions set up ISS equipment on two modular barge floats. The first of which included: a batch plant (cement/slag silos, pumps, high shear mixer and water tank) and two debris removal containers. On the second barge, an 180,000 lb. 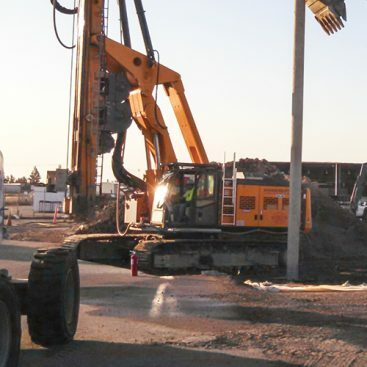 hydraulic drill rig, a CAT324 excavator (debris removal) and three conex containers used for an office and tool storage. 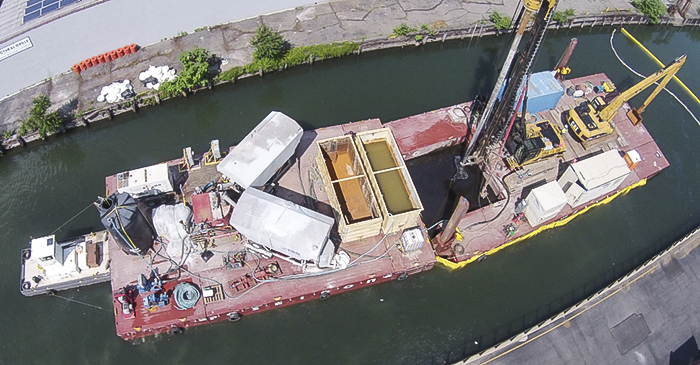 After construction of the support and ISS barges, Geo-Solutions relocated the barges to the drilling site in the Gowanus Canal, located in Brooklyn, New York. The mobilization of the barges was a logistically challenging venture as Geo-Solutions was required to coordinate multiple draw/lift bridges for time sensitive access points while navigating the narrow canal. Upon arrival, Geo-Solutions immediately strung oil booms and turbidity curtains around the ISS test program location. 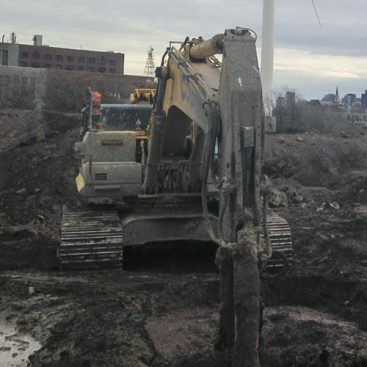 During operations, Geo-Solutions performed an initial sweep for debris contained within the sediment. Following debris removal ISS activities commenced and 226 ISS columns were installed over the 18 days of soil mixing. These columns were installed at various depths within the transitional phase of the soft and native sediments. Operational parameters for the ISS of sediments were varied to create optimal homogenous mixing while creating minimal environmental impacts to the canal turbidity and sheens. Bulkhead stability was monitoring continuously utilizing multiple inclinometer stations, and GPS targets. A total of nine (9) different mix designs and three (3) reagents were utilized. Both 6 foot diameter and 8 foot diameter auger sizes were evaluated. Varying results were achieved with the different mix designs as anticipated. 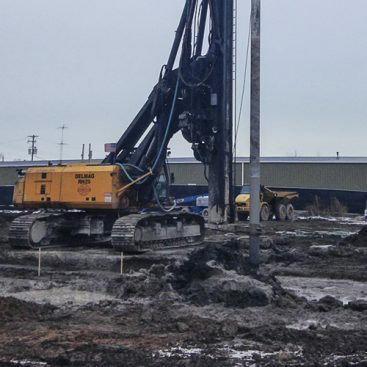 The native sediment was solidified discretely through in-place soft sediments to achieve a 5-8 foot thick monolith which will later support a reactive cap system. The local barge mounted turbidity curtains were sufficient to control sheens, NAPL, and turbidity. The Pilot Study data was summarized for the client to provide to the EPA and stakeholders for full scale design considerations.